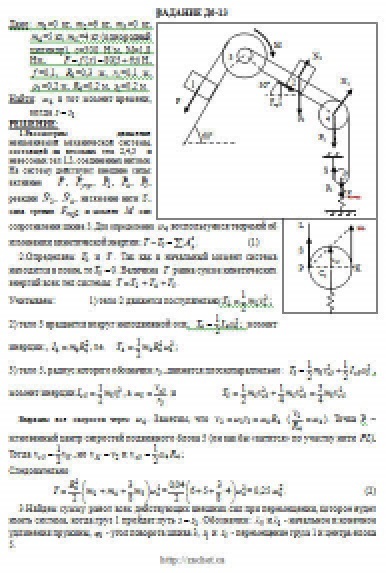 The mechanical system consists of loads 1 and 2, a stepped pulley 3 with radii of stages R3 = 0.3 m, r3 = 0.1 m and radius of inertia relative to the axis of rotation ρ3 = 0.2 m, block 4 of radius R4 = 0.2 m and a roller (or a moving block) 5 (figure D6.0 - D6.9, table D6); The body 5 is assumed to be a continuous homogeneous cylinder, and the mass of the block 4 is uniformly distributed along the rim. Coefficient of friction of loads about the plane f = 0,1. The bodies of the system are connected with each other by threads threaded through the blocks and wound on a pulley 3 (or on a pulley and roller); The sections of the filaments are parallel to the corresponding planes. A spring with a stiffness coefficient c is attached to one of the bodies. Under the action of the force F = f (s), which depends on the displacement s of its application point, the system comes into motion from a state of rest; The deformation of the spring at the moment of the beginning of the motion is zero. When driving on the pulley 3, a constant torque M of the resistance forces (friction in the bearings) acts. Determine the value of the desired value at the time when the displacement s becomes equal to s1 = 0.2 m. The required value is indicated in the "Find" column of the table, where: v1, v2, vC5 - the speeds of loads 1, 2 and the center of mass of the body 5 respectively, ω3 and ω4 are the angular velocities of bodies 3 and 4. All rollers, including rollers wrapped in threads (such as roller 5 in Figure 2), roll along the planes without slipping. In all figures, do not depict cargo 2 if m2 = 0; The remaining bodies must also be represented when their mass is zero.